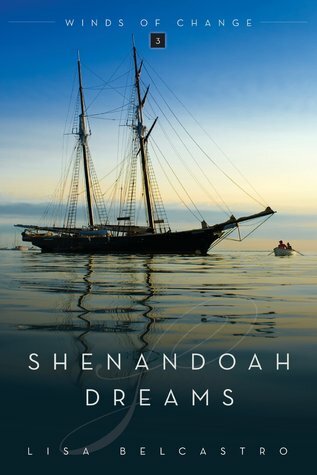 Shenandoah Dreams is the third book in the Winds of Change series and it is a great ride into the past where 21st Century Melissa Smith is swept into the 18th Century. Melissa is a sweet young woman who teaches at the local elementary school. She has been the teacher chaperone on the summer Shenandoah trips for many years. After a failed marriage, she has vowed off men and just enjoys her teaching job, her cat Spike and her friends. God may have other plans for her though when she awakens in 1770. It is true that love drives out fear because although Melissa is freaked out about time traveling from 2007 to 1770 she is also head over heels in love with the Shenandoah’s Captain, Isaiah Reed. Will her desire for Isaiah override her homesickness and longing to return to her life in 2007? In a delightful twist of events, Shenandoah Dreams takes the reader through time travel, healing emotions and the sweetness of falling in love. It’s a wonderful addition to the Winds of Change series! I received this book from the author, Lisa Belcastro in exchange for my honest review which I’ve provided here.